The Russian version of "The God Father-in-Law", the book of Rakhat Aliyev, published in Germany, is distributed via internet in PDF format to everyone, willing to read it. Supernormal readers’ interest to "The God Father-in-Law" is fueled by the prohibition of Prosecutor-General’s Office of Kazakhstan to read and distribute the book, revealing (in the opinion of Prosecutor-General’s Office) the state secrets. Otherwise, one can be persecuted and sentenced to three years of imprisonment. It has to be mentioned that former son-in-law of Kazakh President Nursultan Nazarbayev and the former Ambassador of Kazakhstan in Austria, Rakhat Aliyev, published a book, where he shared everything he knew about his former farther-in-law. Here are the titles of some chapters of this book: "If I was Nursultan I would have three wives", "Nazarbayev makes his first million", "The person who stole the elections", "Who makes money on Astana", "Small weaknesses of Nursultan Abishevich" and so on. We are not going to share and cite the electronic email address where you can request free e-copy of Aliyev’s book in Russian language – the point is that the General Prosecutor’s Office prohibited that and, therefore, everyone will have to find and read the book personally, not counting on the reviewers’ opinion. Mutual hatred between the President and his son-in-law goes beyond all possible boundaries and ethics. They failed to divide the power: Rakhat Aliyev became "Enemy #1" in Kazakhstan after he showed his presidential ambitions. The General Prosecutor’s Office immediately collected the incriminating evidences and the court in Kazakhstan in absentia sentenced him for about forty years of imprisonment for kidnapping, embezzlement of property, managing organized criminal group and preparation of coup d’etat. Aliyev responded though and published the accumulated damaging information about his father-in-law. At the same time, as it was expected he never mentions his guilt in the book: after reading the book one can have the impression that Aliyev is honest, sincere and innocent whereas all the accusations against him is the work of malicious and revengeful Nursultan. This book was prohibited by the General Prosecutor’s Office in Kazakhstan, thus turning the citizens into the hostages of family scandal. It is clear now that if the security officials immediately declared the content of the book as state secret, its stories are at least partially truthful. In 2000 Kazakhstan adopted the law On immunity of the first President of the Republic of Kazakhstan, according to which, Azattyk says, Nursultan Nazarbayev is not the subject for judicial examination for the actions, related to the performance of presidential duties (Italic text is the editorial note), except for the crime, based on lese-majesty. The law also indicates that nobody can confiscate the residence place of the President, his personnel facilities, baggage or official and personal transportation means, correspondence and technical equipment for various types of communications. Based on this law, the General Prosecutor’s Office cannot initiate the investigation against current President, even based on the facts, reflected in the book of Rakhat Aliyev. However, based on this law, the security the General Prosecutor’s Office prohibits reading and distribution of this book. Ferghana.Ru correspondent asked the expert on Central Asia and international observer of Vremya Novostei newspaper, Arkadiy Dubnov, how legitimate the actions of the Prosecutor’s office are, which threatens by criminal responsibility for reading or distribution of Aliyev’s book. "In my opinion, such criminal prosecution is the evidence of age-related infirmity of the regime – Dubnov answers. – If main regulation authority demonstrates such response to the book that reveals something, being common knowledge of any person, aware of situation in Kazakhstan, this only talks about possible close annihilation of the entire current state of Kazakhstan. Today, at the end of the first decade of XXI century and when the entire world is internet-users it is a shame to put or even announce such measures. It is amazing how short-sighted the current law enforcement bodies are in Kazakhstan if they attempt such measures. They will be short of paper for filing the criminal cases against those who already read this book today". Speaking of those who already read the book, the prominent Kazakhstani journalist and human rights activist Sergey Duvanov directed open letter to Respublica newspaper editorial office. The letter indicates that "Today on May 21, 2009 I got to know from mass media that, giving a speech in Astana, the official representative of General Prosecutor’s office Saparbek Nurpeisov announced that all people, reading and distributing "The God Father-in-Law" book, written by Rakhat Aliyev, will be persecuted. Being law-abiding citizen I am stating that I already read the book. Moreover, after reading the book I shared it with Andrey Sviridov (Kazakhstani human rights activist and journalist – editorial note). Possibly, he also distributed the book among his friends. Therefore, after reading and distributing the book I understand that this is a criminally punishable act. I openly admit this. Considering above-mentioned information I am awaiting the criminal persecution. It is better to be treated as criminal by the prosecutor’s office and freely read the books than obediently perform obscurantism-based orders and laws". On May 25 Sergey Duvanov shared with Ferghana.Ru correspondent that there have been no response of General Prosecutor’s Office yet. Such inactiveness of the law enforcement bodies is quite reasonable – some experts believe that the security officials will take no active actions. 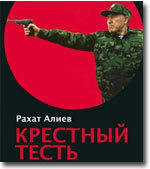 General Directors of IAC Alexei Vlasov shared with Ferghana.Ru that the announcement of criminal persecution for reading and distributing this book is "the first and impulsive official response that might be little indigested that demonstrates the desire to block broad distribution of the book in Kazakhstan at the very early stage. It is not quite clear how the Prosecutor’s office is going to control the reading or non-reading of the book. Even Nikolay’s Russia in XIX century was famous for strict censorship of literature and criminal persecution for not only for distribution of prohibited books but also for the reading. I believe that there is no way back for the Prosecutor’s Office, but this criminal persecution for the reading of the book will have no realistic application". On the other hand, there is an opinion that data, contained in the prohibited book of disgraced son-in-law, can inform about other criminal events. The representatives of some opposition forces in Kazakhstan – Communist party and unregistered Alga party – believe that after reading "The God Father-in-Low" the relatives of prominent politician Altynbek Sarsenbayev, killed in 2006, can request additional investigation of the murder. "This book can become quite reasonable case for the relatives of Altynbek Sarsenbayev to demand reconsideration of the case or additional investigation in concern with published facts", the Head of Alga party Vladimir Kozlov informed at press-conference on Monday. He also noted that: "It is best seller in the West. The facts about the murder of Altynbek are accessible to millions of people". Responding to the questions of journalists on the notification, released by General Prosecutor’s Office, about criminal persecution for distributing and reading the book, the representatives of both parties said that they already read the book. "People of my age do not go to jail. I read the book. I do not see state secrets there", the leader of Kazakh communists Serikbolsyn Abdildin says, KazTAG reports. Vladimir Kozlov is affirmed that, prohibiting the book, the General Prosecutor’s Office will face the adverse affect in Kazakhstan. This way they contribute to PR campaign of disgraced Aliyev’s book. "If Rakhat Aliyev needs to promote his book there is nothing smarter than to force incompetent General Prosecutor’s Office to prohibit that book", the opposition leader notes. "Speaking of punishment for reading the book this is the violation human rights for free access to information and its dissemination. There is nothing worse in the country that will be the chairman in OSCE next year", Kozlov concluded. Abdildin also believes that "the prohibition plays for Rakhat". "Sometimes, the President’s team produces some weird decision that it is not clear which official came up with the idea – pro-president or anti-president", he added. P.S. On May 25, the General Prosecutor’s office in Kazakhstan disseminated press-release that says "the mass media interpreted the explanation of the official representative of General Prosecutor’s Office, stated at the briefing, dedicated to the dissemination of information about state secrets other protected information, published in "The God Father-in-Law" book of Rakhat Aliyev, as the prohibition to read the book. In this concern, the General Prosecutor’s Office declares that this statement is false. The criminal persecution is conducted only for distribution and illegal import of this book to the republic".